Florence is the Italian icon city of Art and Beauty worldwide. It is famous for its historic monuments, the romantic views from the hills and for the famous palaces that can be the perfect frame for your portraits. Florence would be the impeccable location for your destination wedding. This romantic town can offer you many solutions: we have accurately selected some venues, villas and hotels to suggest you. You can design, plan and produce your amazing wedding in Florence! If you wish to plan a Florence week end for your destination wedding we will be pleased to help you step by step! We will be by your side to help and recommend how to organize your special destination wedding in Florence! Please, do not hesitate to contact us! This Luxury Wedding Hotel in Florence is the most elegant venue you can think of for your unforgettable Wedding in Florence, just few minutes from the center of the fascinating city of Florence. 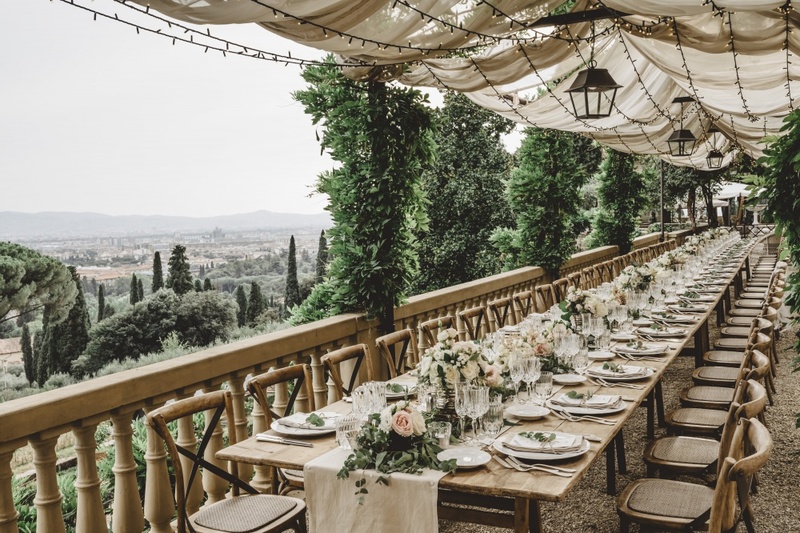 This ancient noble residence of the 19th century, with its refined spaces, big park, surrounded by woods and gardens is a frame of unrivalled beauty for your Reception in Tuscany. You can organize a wonderful Cocktail reception in one of the Gardens or in the elegant Café of this Luxury Wedding Hotel in Florence: for groups until 40 guests the beautiful Roof Terrace is available, perfect for a cocktail with a view or for an openair ceremony! This Luxury Private Villa in Tuscany is situated few minutes from the Florence city center, in a panoramic setting with a splendid view of the Tuscan countryside and the city. This Villa and its fortress have a long and prestigious history and have been restored with a great attention to detail and style. The external structure of the house with its warm colors matches perfectly with the surrounding greenery, while the internal spaces have the unmistakable Tuscan country chic style realized with neutral soft colors, precious furniture and draperies. The Villa has 7 rooms and suites which can accommodate up to 14 guests: their cozy atmosphere and understated elegance will add a special touch to your Tuscan stay. If you dream of a really elegant, refined, chic location for your Big Day, this luxurious wedding hotel in Florence is definitely the right place for you. You will be captured by the beauty of this hotel, a Villa of the 15th century placed on a hill not far from the Florence, with a breathtaking view on the city. For your Wedding Reception this enchanting place offers various possibilities, different spaces with different appeal, all elegant and exclusive. The small terrace is perfect for an intimate symbolic ceremony while if you look for a bigger space for a blessing or for the after ceremony Cocktail reception, the lush enchanting Italian Garden is a frame of unique beauty.